The arrow is pointing up for spicy candy right now. I think this could be a great Father's Day add-on! Maybe you’ve noticed Jolly Ranchers has a hot variety now? There are also hot Skittles all of a sudden, and …spicy Starbursts?! Why are these new flavors coming out? Like chocolate and peanut butter, trendiness and candy have always gone together. Big candy companies follow trends and create fun variations to sell more candy. That’s what they do. So, what is the trend they are seeing? How about: Sales of spicy and hot flavored candy were up 16% in 2017 and 25% in the past 52 weeks. Those are extremely significant numbers, an overwhelming sign of a trend. That’s especially true when compared to candy overall, which is growing less than 1% industry-wide. “Sales for non-chocolate spicy and hot attributed candy products are growing eight times faster than non-chocolate in general, at a rate of 25%,” said Larry Levin, EVP of Consumer and Shopper Marketing for market research firm IRI. One unique factor that contributes to this trend is the rising popularity of traditional Mexican candy – which caters to the more spicy and savory flavors popular in Mexico. 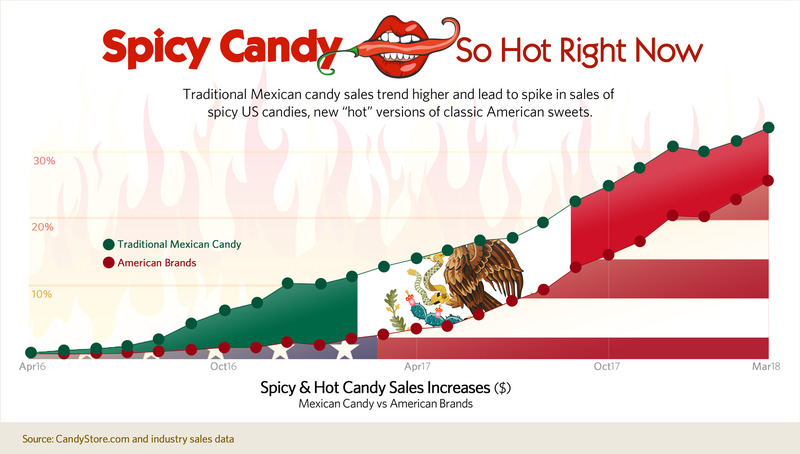 CandyStore.com has noticed this rise in Mexican candy and put some numbers behind it to see the correlation between Mexican and American brands’ spicy candy. It’s pretty interesting. Digging through sales data from CandyStore.com and industry partners, traditional Mexican candy sales are up close to 31% over the last 18 months, 35% in the last 24 months. While American brands’ spicy candies are up 24% in the last 24 months. The graph shows an earlier upward movement of Mexican candy and a strong reaction by the US brands to ramp up thereafter. This reaction included the creation of all those new “hot” flavors of candy showing up. 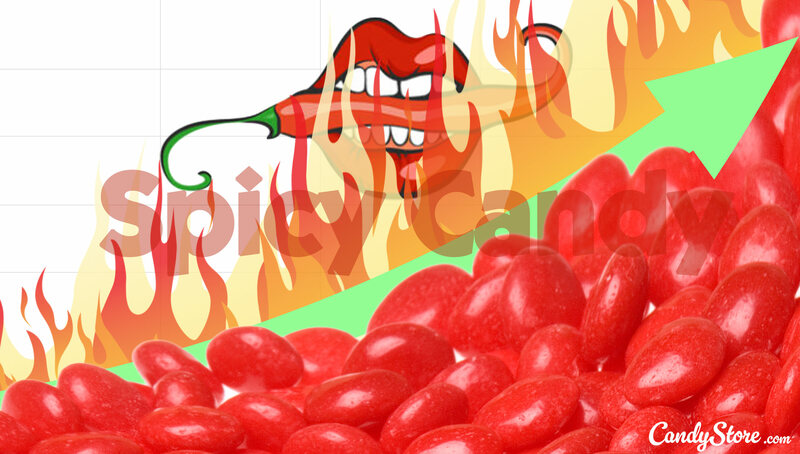 As pointed out by Danielle at Madison.com, even the makers of Red Hots and other already hot candies are offering new, multiculturally-influenced spicy flavors. Kick’n Mango Lime Red Hots, anyone? The trend seems to still be on a sharp increase which means it probably hasn’t hit it’s peak yet. No telling when that could happen. Mexican candy is more available now than ever. More and more Mexican made candies are being imported, which could be part of a virtuous cycle of increased availability creating more awareness and thus demand. With the recent sriracha and habanero trends in the overall food world, it’s maybe not surprising that traditional Mexican candy sales have seen a significant boost. A larger overall trend in the food world towards new spices and spicy flavors likely lead to increased sales of increasingly available Mexican candy, which triggered American candy makers to jump on board too. Sometimes these candy trends are short-lived and the new flavors vanish forever. If you are intrigued, try these products soon …before the next trend takes over. I have some ideas about that too. My next piece will cover a candy trend that is in an earlier stage than spicy is now. If you have more questions about spicy candy or need anything at all, please contact me at the email below.